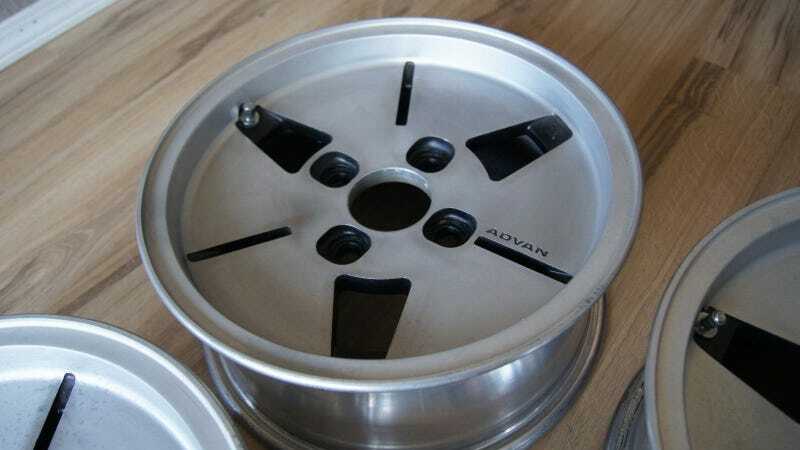 Advan Wheels, a division of Yokohama Rubber Company, has been on the scene for decades, but rose to prominence in the US throughout the 1980s for building fresh off-the-wall wheel designs that fit the needs of import car enthusiasts. If you’re already going to be driving an oddball Japanese car, you may as well fit it with oddball Japanese wheels. Advan has built a bunch of strange looking wheels that I adore, and some of those will likely end up featured in this column in the future. For the moment, however, I’m focussing my efforts on what is perhaps their strangest wheel design, the ‘ADA’. This wheel’s design is bizarre, to say the least, and that is exactly why it’s here. By making the face of the wheel an almost-uninterrupted disc, it is probably quite aerodynamically sound, but doesn’t do much to allow air flow for brake cooling. With a lot more solid aluminum taking up space where most wheels would have spokes, it’s also not exactly light weight. This seems counter intuitive to what you might expect for a wheel marketed as a motorsport option. It’s just so freaking cool looking, though. I’m an absolute sucker for early JDM culture stuff, and these wheels definitely fit the bill. This particular set is sized 14x6 with a 4X114.3 bolt pattern for use on various 80s and 90s Japanese cars. They’ve got a little bit of curb rash on them, but the $500 price tag reflects their condition. Personally, I’d love a set of these on a 3rd generation Honda Prelude, the one with the flip-up headlight covers. If you’ve got the right car in mind for this totally weird set of wheels, check out the eBay listing for more information and photos.